The 2011 Mercedes-Benz CL550 luxury coupe goes on sale next month. Mercedes-Benz is launching a new generation of direct-injection, twin-turbocharged V-8 engines with more power and better fuel economy beginning with the freshened 2011 CL coupe that goes on sale next month. 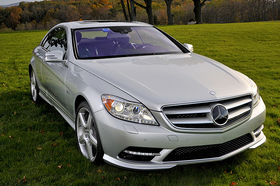 The CL550 has a 4.6-liter V-8 that replaces a 5.5-liter V-8. The new powerplant will be used in the S-class sedan and E-class family in the 2012 model-year. 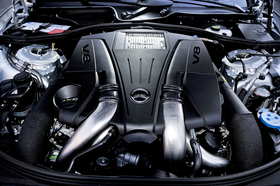 The second new engine is a 5.5-liter V-8 built by Mercedes-Benz' high-performance AMG division. That engine replaces the normally aspirated 6.3-liter V-8 and will be used not only in the CL63 AMG but also in other AMG vehicles. It has direct fuel injection and a start-stop feature that turns the engine off when the vehicle stops and restarts it when the gas pedal is pressed. The 4.6-liter, 429-hp engine is 20 percent smaller than the powerplant it replaces. The direct-injection bi-turbo engine uses two turbochargers and has 12 percent more horsepower than the outgoing engine but is 10 percent more fuel-efficient. The new 5.5-liter engine has 536 hp, an improvement of 3 percent, and is 20 to 30 percent more fuel-efficient. Final EPA fuel economy numbers for the vehicles with the new engines are not yet available. Mercedes-Benz will keep using the current generation V-12s in the CL600 and the CL65 AMG. The 4.6-liter, 429-hp engine is 20 percent smaller than the powerplant it replaces. The CL coupe, based on the four-door S-class sedan, has new sheet metal from the A-pillar forward and new front and rear headlights. The current generation first went on sale as a 2007 model. The CL550 is standard with all-wheel drive, which is not available on the AMG version. • Active lane-keeping assist uses a camera, radar and sensors to detect if the car crosses painted road lines. The system brakes the wheels of the opposite side of the car so the vehicle stays in its lane. The camera is mounted on the inside of the windshield. • Active blind spot assist (standard on V-12 models) lights up a red triangle in the side mirror if another vehicle is too close to the side and rear for a lane change. If the driver ignores the warning, uses the turn signal and begins to move over anyway, the system buzzes. If that doesn't stop the driver, the car's brakes are partially applied on the opposite side as a countersteering measure. • Active lane-keeping assist and active blind spot assist are part of a driver-assistance package that also includes distronic plus adaptive cruise control. It costs $2,900 on the S400 Hybrid and $2,950 on the CL550, S550 and S63; and is standard on the S600 and S65 models. The package costs $2,900 on the E-class sedan and wagon.